What is Samsung planning for its next smartwatch? Smartwatches are selling, but not quite in the quantities that the likes of Apple and Samsung want to see, so manufacturers are casting around for ways to make these wrist-based gadgets a little bit more appealing to you and me and everyone else. Enter a recently spotted Samsung patent: a smartwatch display that extends by projecting itself onto the back of your hand. With the extra space, you can more easily control what's on screen, though you might look a bit stupid while doing it. For example, you could get extra information about local landmarks on maps, Samsung suggests, or perhaps it could be used as a way of inputting natural handwriting on a smartwatch for signing digital documents. Only a few days ago we saw an early and experimental way of using your own skin as a way of controlling a smartwatch, and Samsung's latest idea is along similar lines - making use of your whole arm for interacting with the tiny wearable wrapped around your wrist. 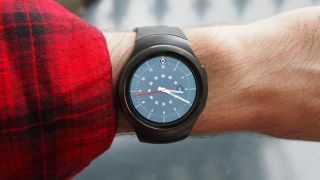 That would solve one of the main problems with smartwatches - their screens are so small it's often just easier to take a phone out and use that instead, which kind of defeats the whole purpose of wearing a smartwatch in the first place. The usual patent disclaimers apply: while this shows some of the thinking going on behind the scenes at Samsung, there's no guarantee that this sort of tech will ever see the light of day if the company can't make it cheap or reliable enough. Still, it's the sort of innovation we'd like to see on the next wave of smartwatches.